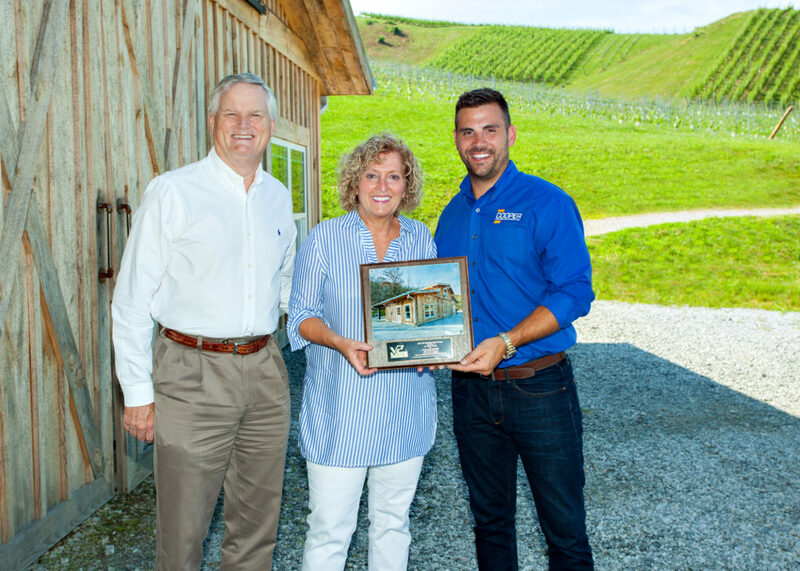 Stone Ashe Vineyards, a 2,000 SF winery located just outside of Hendersonville, NC, was recently recognized by Varco-Pruden in the their 2018 Hall of Fame Awards as the winner in the Agriculture & Food Processing category. This project used both pre-engineered and conventional construction for a budget-conscious yet beautiful structure. Rough sawn local pine and metal were paired together for an industrial yet earthy facade to provide the modern exterior with warmth that the owner desired. The Stone Ashe Vineyard agricultural barn is more than a building used for storing equipment. It is a collaboration with Zach Cooper and Cooper Construction to marry tradition with progress. The rough-hewn exterior reflects and acknowledges the areas agricultural history. The building itself was uniquely constructed to be innovative and unobtrusive as it quietly rests within the hilly terrain of Western North Carolina. It is beautiful yet its functionality permits the daily use of housing specialized vineyard equipment needed to farm in this unique geographical area. It reflects the philosophy of Stone Ashe Vineyards in keeping attached to the land and promoting sustainability. In the near future, Stone Ashe Vineyard will begin construction of a tasting room and wine production facility which express the “terroir” (region’s climate, soil and terrain) of the distinctive geology of Henderson County. The goal of Stone Ashe Vineyards is to make world class wine in Henderson County through sustainable viticulture and to work in harmony with the land. Cooper Construction, a third generation family-owned and operated general contractor, is located in Hendersonville, NC. Founded in 1967, Cooper has served the building, utility and HVAC needs of public and private clients in North Carolina, South Carolina and Tennessee for 50 years. Unlike many contractors, who develop their niche in a certain building type, Cooper’s specialty is the diversity of their general construction projects. They are experienced in projects ranging from small renovations to multi-million dollar single contracts with clients in nearly every segment of the Construction industry.